These are the best instant pot chicken wings, covered in a delicious BBQ sauce and cooked to a crispy perfection! They’re a delicious snack for a party, appetizer for a gathering, or a fast and easy home cooked meal for dinner. For another great appetizer, check out our recipe for Instant Pot Little Smokies. Chicken wings are never a bad idea. I love that they are low carb, yet full of flavor. And, when it comes to chicken wings, the instant pot gets them to the perfect level of crispiness. The best part about cooking meat in an instant pot is that you can use frozen or thawed meat. I can’t tell you the number of times I have forgotten to take meat out of the freezer and scrambled to get it to thaw in time to cook it. 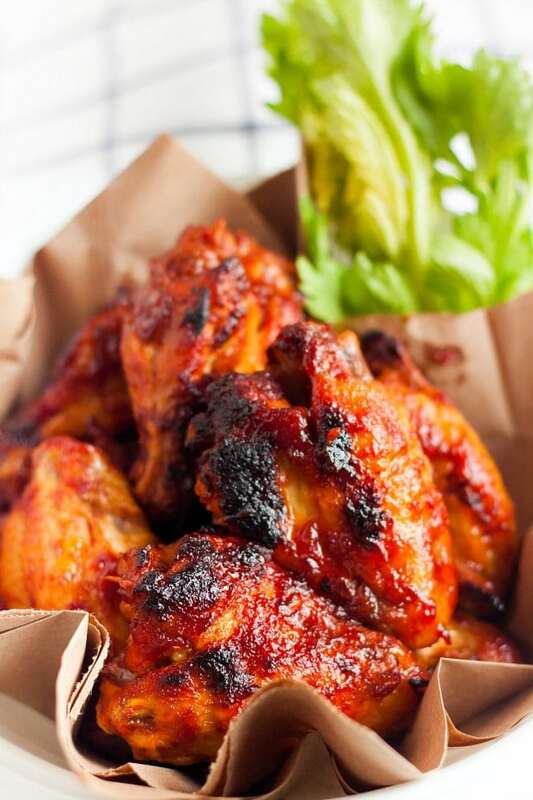 This recipe includes a delicious, savory BBQ sauce for the wings, and it is amazing! Plus, the sauce is really easy to whip up. First, place the wings (frozen or thawed) in a single layer in the pressure cooker of the instant pot. Next, you will need to make the sauce. If you are choosing to use a different sauce or a pre-made sauce you can skip this step. 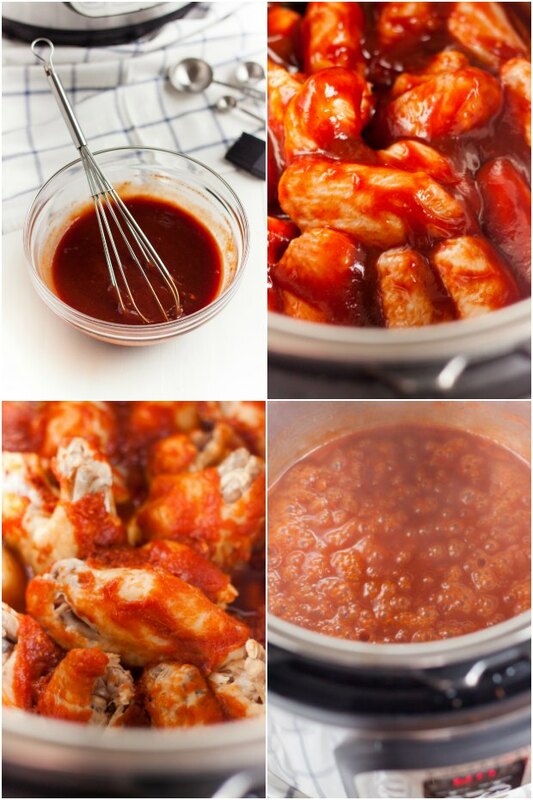 To make our savory BBQ sauce, whisk together the BBQ sauce, ketchup, balsamic vinegar, Worcestershire sauce, sugar, mustard, chili powder, cumin, and cayenne powder. Then, pour the sauce evenly over chicken in the pressure cooker. Lock the lid and seal the vent. Set the instant pot to manual mode, high pressure for 10 minutes. Perform a quick release. Then, remove the chicken pieces using tongs and place on a baking sheet. Set the instant pot to saute mode and let the sauce cook down for about 10 minutes. Sprinkle and whisk in cornstarch to thicken the sauce. Then, baste the sauce onto chicken wings. Broil the wings with sauce for about 5 minutes in the oven. Finally, add more sauce to each wing and broil them for about another 5 minutes. Flip the wings and baste and broil for another 5 minutes. Just like that, you’ve got a delicious snack for a party, an appetizer for a gathering, or a delicious home cooked meal for dinner. You can use your instant pot to reheat leftover wings. It’s very easy to do so using the pressure cooker for the instant pot. You will have to use some water to make steam. Add at least a cup of water to the bottom of the instant pot. Next, put the trivet in place and put the pot inside. Then, using heatproof containers (I usually use glass), add a bit of extra sauce to the wings and cover the container with foil. Then, set the steam time. I usually set the time to about 5 minutes. 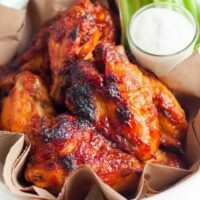 You can also reheat the wings in the oven by setting the oven temperature to 350 degrees F, placing the wings on a baking sheet, add leftover sauce to the wings, put the baking sheet in the oven and reheat the wings for about 5 minutes on one side, and then flip them and heat again for another 5 minutes. Either option will make for crispy, fresh tasting wings! You won’t even know they were leftovers. What Sides Go with Wings? If I’m making the wings for dinner I like to serve them a side caesar salad., macaroni salad or coleslaw. Of course, you can’t have wings without celery and blue cheese. The combination is pure magic. For dipping sauces, think homemade ranch as well as an extra side of whichever sauce I have on the wings. There are never enough dipping sauces when it comes to wings! 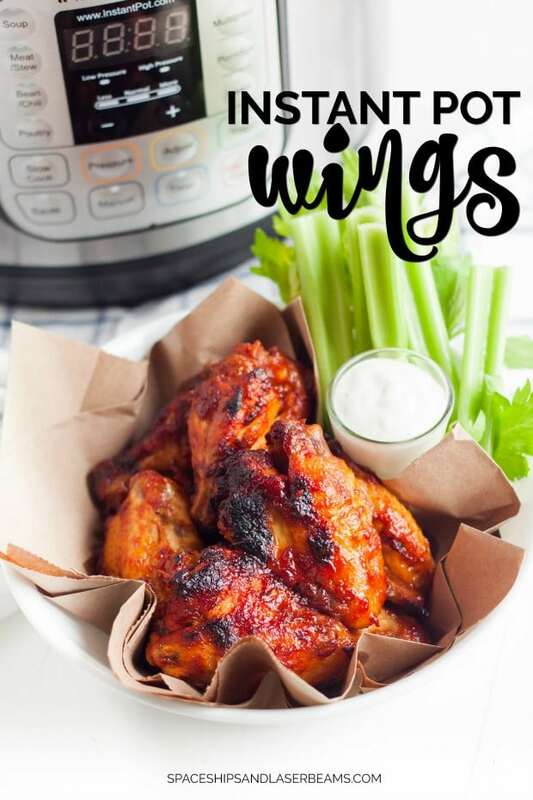 Making wings in the instant pot is so quick and easy. This recipe is great because it is so versatile. 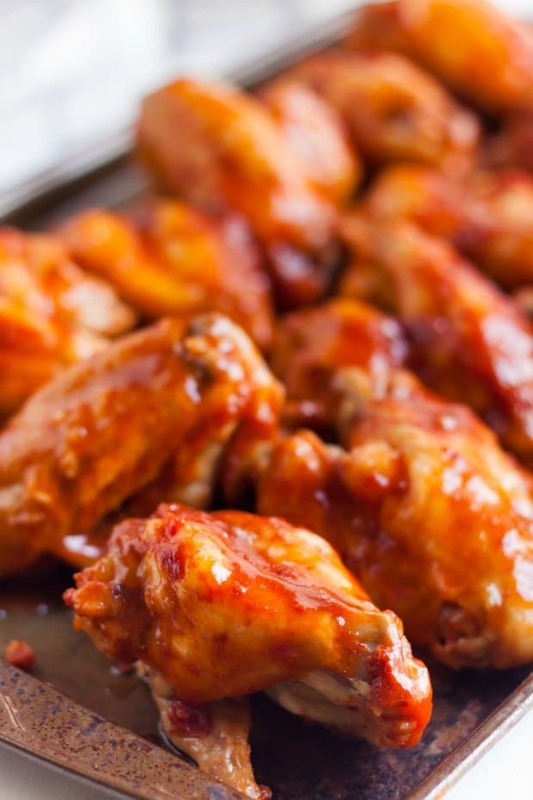 By switching up your sauce and sides you can make wings often and not feel like you are eating the same thing. It’s bound to become one of your favorite instant pot recipes in no time. Serve with celery and chunky blue cheese dressing to really make it magical! Place wings in a single layer in the pressure cooker. Whisk together bbq sauce, ketchup, balsamic vinegar, Worcestershire sauce, sugar, mustard, chili powder, cumin and cayenne powder. Pour over chicken. Lock lid and seal vent. Set to manual mode, high pressure for 10 minutes. Remove chicken pieces using tongs and place on a baking sheet. Set cooker to saute mode and let sauce cook down for about 10 minutes. Sprinkle and whisk in cornstarch to thicken sauce. Baste sauce onto chicken wings. Broil for about 5 minutes. Add more sauce to each wing and Broil for another 5 minutes. Flip wings and baste. Broil for 5 minutes. YUM, we love these – such an awesome, easy appetizer or snack!